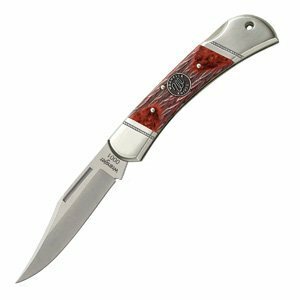 The nickel silver bolsters add to the shiny style and durability of this knife. And this handle is beautiful: red picked bone with a Wrangler antiqued bronze shield in the center and an engraved rope ring. You'll like that the blade closes via a new lockback mechanism: a spring-mounted system in the handle that means the blade will only close if you want it to. If showmanship is more your style, you'll be additionally pleased to know that each knife is serialized for collectability. Whether you use it or display it, you're sure to like it either way.